You can bet Vic was a little happy inside because he got the weekend off from being the Instagram Boyfriend! We pretty much just spent the weekend catching up on the last season of Pretty Little Liars and finally finding out who A.D. is!! I was NOT impressed with the outcome, ugh! Okay, enough ranting. YOU GUYS. THIS DRESS. is. a. DREAM!!!! This gorgeous white lace ruffle dress literally has my heart!! I love love love the gorgeous lace overlay details throughout the neckline and the sleeves. 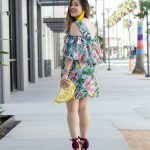 I’m also dying over the super cute ruffles on the dress, too! This white lace ruffle dress would make the PERFECT wedding rehearsal dress, don’t you think? It’s super cute and the lace throughout is literally to die for! 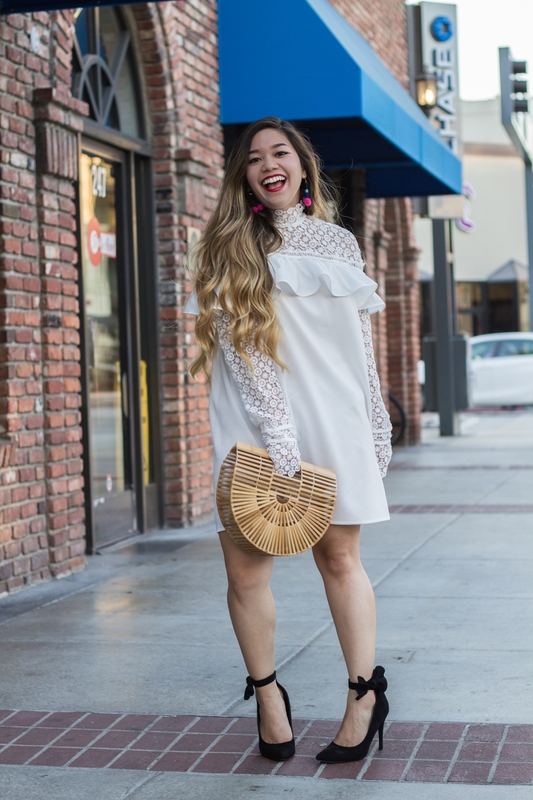 The best part about this white lace ruffle dress? It’s only $28!!! For reference, I’m wearing a medium! You can get it here! 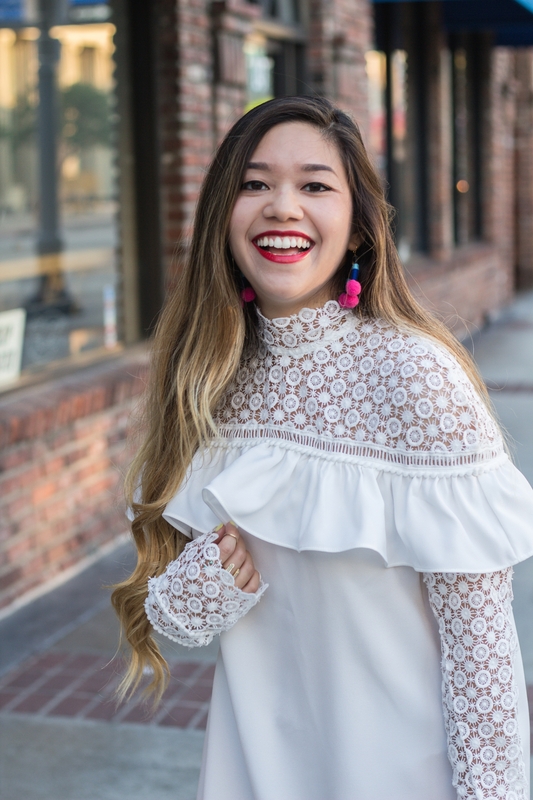 I LOVE how the lace extends to the neck, too – It’s SO chic! The lace on this white lace ruffle dress also extends towards the tips of your fingers. 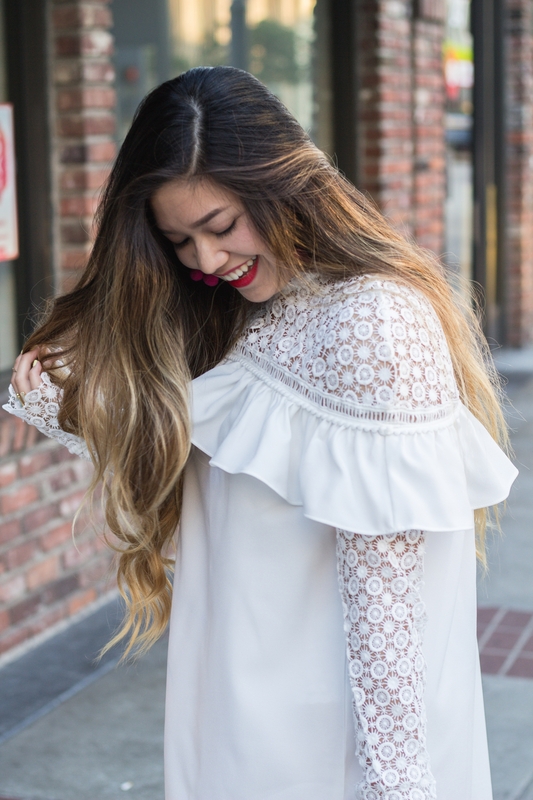 Seriously, this white lace ruffle dress is just too darling! I also paired my white lace ruffle dress with the most wanted bag of the season – the Cult Gaia Ark bamboo bag! If you read my last post, then you know that I found the perfect dupe for the Cult Gaia bag for only $69! I’ve linked both the small and large version down below! Obsessed with that dress and bag! This white dress is gorgeous! I love the ruffles! Wow I love, love, love the sleeve details! Gorgeous! P.S. What comment box do you use? I want to try this type. This dress is definitely unique. I’ve never seen anything like it! I don’t know if I am bold enough to wear this but you make it look gorgeous. This dress is seriously so pretty! I love how you added a pop of colour with those earrings too! What a marvelous outfit! I love that handbag it’s so unique! The dress obviously gorgeous. And your smile is the best accessory of the outfit! What a cute dress! I haven’t seen anything like it before, it’s super unique! this dress is so cute and i love your heels! This dress is darling!! I love the ruffle and the gorgeous lace detailing! Such a cute dress! You picked out lovely outfits. They all look so good on you. Enjoyed so much. Thank you so much for sharing the awesome post.